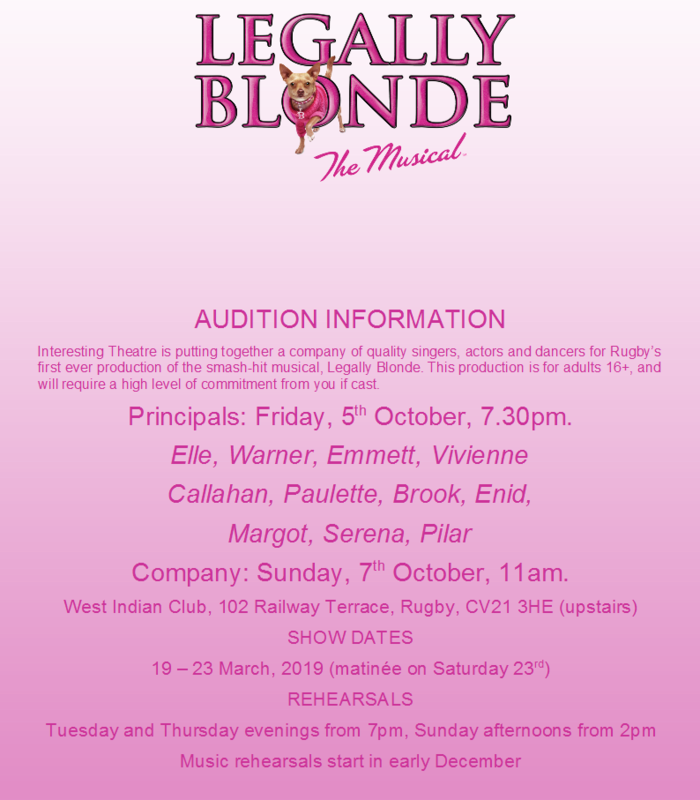 Please register to obtain audition material for Legally Blonde. When you receive your pack, please email us if you cannot make that date or have any other questions! Please prepare the audition pieces for the characters you are auditioning for. You only need to print out the relevant pages from the pack! Please complete and return the audition form sent to you, also available below. Please arrive at the audition shortly before the start, or the timeslot allocated to you if applicable. Wear clothing suitable for the dance/acting audition you are attending. We understand it can be very nerve-wracking, so we make allowance for this when hearing you. You do not have to learn the audition pieces by heart. Please give it your best shot, and don’t be afraid to start over if you wish. Feel free to ask questions at the audition or in advance – email: info@interestingtheatre.org.